At every available opportunity copyright holders criticize Google for not doing enough to stop online piracy and every step taken by the search engine only results in more demands. Meanwhile, Microsoft's Bing flies largely under the radar, providing a video and TV show search tool that Google would not dare introduce. Google is only too aware of its currently unpopularity with rightsholders. While the search giant provides superb and often vital Internet services, the music and movie industries are desperate for infringing results to disappear from Google’s indexes. Every week the search engine receives millions of DMCA takedown notices requiring it to take case-by-case action, but the company’s reluctance to do something more permanent has made it search-engine-enemy-#1 with copyright holders who never miss an opportunity to lay on the criticism. 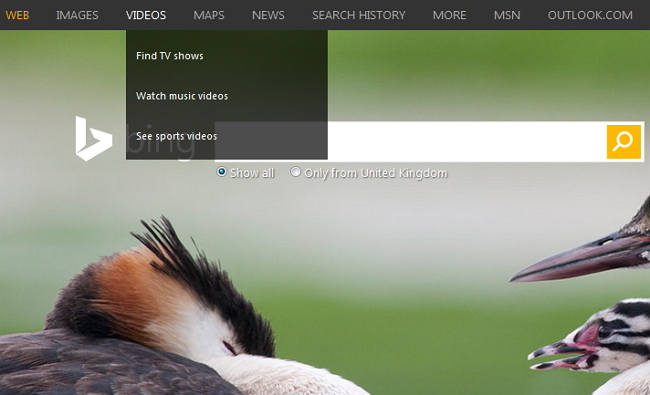 In the background, however, Microsoft’s Bing flies comparatively under the radar. Sure it processes plenty of takedown notices too, but it receives little of the corporate pressure piled onto Google. This can only be a result of Google’s place in the market, since Mr Don’t Be Evil has done more than its rival to combat piracy. 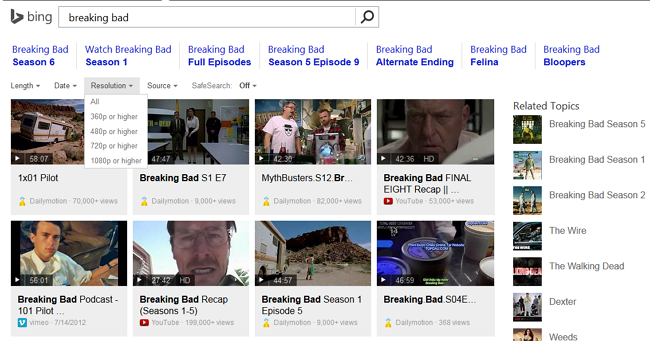 Case in point, Bing’s powerful and somewhat under-used streaming video search engine which offers to find TV shows from the get-go. While Google gets heavily criticized for its AutoComplete feature (which is already partially censored following copyright holder requests), Bing has no problem in first offering TV shows and then completing suggestions of what to watch. Tap in “BRE” and at the top of the list appears BREAKING BAD. 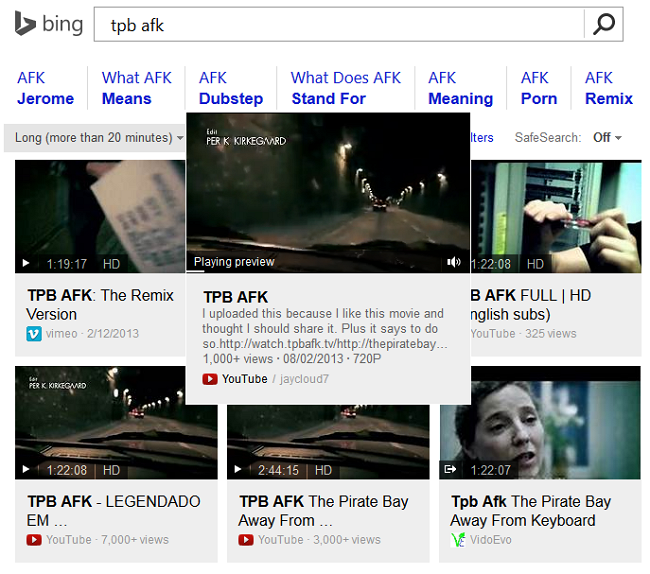 We clicked the option – Bing delivered. The first few results are shown below but those are just the tip of the iceberg and more specific show searches hardly ever come up short either. The auto-suggestions at the top of the screen are there in case ideas run out too, helpfully pushing the user towards varies series and specific episodes. As can be seen from the image above, those who are fussy over the quality of the content being presented can filter by resolution too, right up to 1080p. Also, restricting searches to videos over 20 mins rejects many trailers and other samplers in favor of episodes and full length movies. Aside from being a pretty good search engine (it came up with some long-forgotten TV show pilots from the 1970s), Bing also has a rather nice trick up its sleeve. Hover a mouse over any video thumbnail shown in the results and its size will instantly increase to display a proper video preview of the content in question. As far as we’re aware, no other search engine online today does that. Of course, someone at Bing isn’t deliberately programming its engine to present infringing results, those are determined by intelligence gleaned from user search requests. That being said, if Google debuted a new “TV Show” search engine tomorrow and began auto-completing and auto-suggesting infringing TV content, weeks-long industry hysteria would ensue. It’s also worth pointing out that Google also has a decent video search which is almost certainly used by many, many more millions than Bing’s. It’s nowhere near as glossy and definitely not as ‘risky’ in how it presents content, but that won’t stop the search company from continuing to take most of the rightsholder flak due to its colossal userbase and its uncontested position in the market. Make no mistake, Google will remain in the firing line for the foreseeable future, even while other companies get away with much, much more. But their time will come, it’s almost inevitable, an event that could be triggered by Google caving in to increasing rightsholder demands.